With over 27 years experience of manufacturing optical fibres, AKSH is able to offer an extensive product portfolio made to achieve the highest levels of quality and performance. Coupled with a deep understanding of present and future requirements, AKSH Optifibre Limited's product range is targeted at the differing needs of the market. 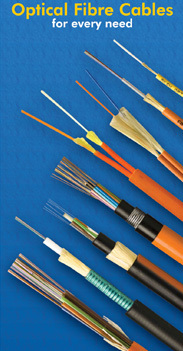 AKSH's state-of-the-art optical fibre and optical fibre cable plants are located in Rajasthan, India. AKSH offers a complete range of end-to-end terrestrial fibre optical cables for a variety of applications in telecommunication networks. Supported by its own integrated optical fibre facility & a dedicated R&D center, AKSH's range of fibre optical cables deliver superior performance in data transmission and performance reliability.